VANCOUVER, Jan. 22, 2018 /CNW/ - Hannan Metals Limited ("Hannan" or the "Company") (TSX.V: HAN) (OTCPK: HANNF) is pleased to announce that seven new anomalous areas have been identified by an extensive soil geochemical survey covering greater than 200km2 surrounding the 100%-owned Kilbricken zinc-lead-silver deposit in County Clare, Ireland. The Kilbricken deposit forms a strong geochemical signature at surface and the geochemical surveys were undertaken to search for new anomalies in a similar geological setting to that of Kilbricken. In combination with other geological data, these new anomalous soil areas are considered immediate high priority drill targets. A total of 961 samples have been collected to date. Further soil sampling on Hannan's County Clare project to infill and extend anomalies is continuing. Mr. Michael Hudson, CEO and Chairman, states: "Our double-pronged exploration strategy in Ireland is now taking shape. At the prospect scale, Hannan's previous 6 months of drilling near Kilbricken has successfully expanded the mineralized footprint outside the resource area. At a regional scale, this newly acquired regional soil data, in combination with the recently completed 42km 2D seismic survey, provides the excellent opportunity for additional discoveries. 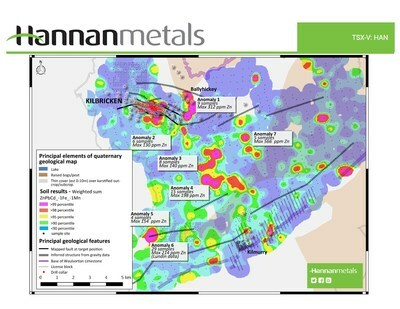 The soil survey clearly demonstrates the zinc-lead prospectivity of Hannan's extensive landholding of 35,444 Ha, with seven Kilbricken-sized multi-point anomalies located in prospective geological settings." Geochemical sampling grids at Hannan's Clare County project now cover >200 km2 with a soil sample spacing of 500m x 250m. Over the Kilbricken prospect a 30 km2 area was covered with a denser grid with 250m x 250m spaced samples. Recent sampling by Hannan now comprises a total of 961 samples which together with 1,633 samples collected by Lundin Mining totals 2,594 samples (Figure 1). The sampled area is covered by a thin veneer of glacial till derived from limestone and karstified bedrock. Certain information set forth in this news release contains "forward-looking statements", and "forward- looking information" under applicable securities laws. Except for statements of historical fact, certain information contained herein constitutes forward-looking statements, which include the Company's expectations regarding future performance based on current results, expected cash costs based on the Company's current internal expectations, estimates, projections, assumptions and beliefs, which may prove to be incorrect. These statements are not guarantees of future performance and undue reliance should not be placed on them. Such forward-looking statements necessarily involve known and unknown risks and uncertainties, which may cause the Company's actual performance and financial results in future periods to differ materially from any projects of future performance or results expressed or implied by such forward-looking statement. These risks and uncertainties include, but are not limited to: The Company's expectations regarding the current and future drill program, liabilities inherent in mine development and production, geological risks, the financial markets generally, and the ability of the Company to raise additional capital to fund future operations. There can be no assurance that forward-looking statements will prove to be accurate, and actual results and future events could differ materially from those anticipated in such statements. The Company undertakes no obligation to update forward-looking statements if circumstances or management's estimates or opinions should change except as required by applicable securities laws. The reader is cautioned not to place undue reliance on forward-looking statements.